Welcome to Discover Orchids - "We are growing for you." WELCOME TO DISCOVER ORCHIDS, Inc.
You may notice that our logo is no longer Discover Orchids, Inc. We closed as a corporation the end of 2004. We still may have items for sale and trade so do not hesitate to contact us. There may be times when it will take a couple days to get back to you on your requests. We hope you enjoy your visit and please let us know what you think. We have made major changes to our site to allow better workings with your internet browser. Please let us know how you like (or dislike) the changes that have been made. We are trying to provide you a place to locate the answers to your questions. Please be sure and visit all of our pages. You will find a large amount of information to help you with your plants. Most of our flower pictures link to an actual photo of the flower on the plant that you would purchase. Feel free to use any of them as a backdrop on your computer screen. We are continually working on this site in order to help your needs so your feedback is very valuable. Send your input to us. For a history of our name and logo click on the logo at the top of the page. We have added links to the right of your screen. Looking for Vanilla? Contact us. 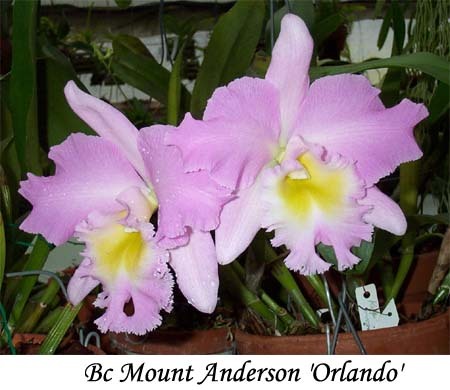 To see a complete list of our orchids we have click in this area. Many can be divided. However we do not post a price list for most because the plant you purchase would normally be a division of the one you see on our website. We need to check for the best place to divide the plant to determine what the cost will be. In most cases we will provide you several optional sizes. You will find a list of the Ribbons and awards we have received for each plant on the web page for the individual plant. Please keep in mind that we have not had the time to attend any shows for quite some time because our www.AerialPhotoLab.com business has been very busy. Again we hope you enjoy your visit! after your total is provided. 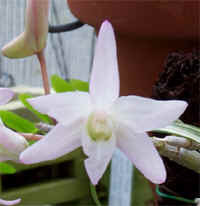 The link above will show you the flower of the month. To learn about Seventh-day Adventist see the link above.